Sponsored by the University Council of Educational Administration, this comprehensive handbook is the definitive work on leadership education in the United States. 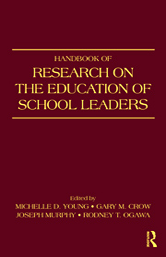 An in-depth portrait of what constitutes research on leadership development, this handbook provides a plan for strengthening the research-based education of school leaders in order to impact leadership's influence on student engagement and learning. Although research-oriented, the content is written in a style that makes it appropriate for any of the following audiences: university professors and researchers, professional development providers, practicing administrators, and policy makers who work in the accreditation and licensure arenas.